I have been building a Massive Orgone Radionic device out of a huge cherry wood chest that reminds me a bit of the Ark of the Covenant. This will be another machine that will be included in the base price of a subscription. It is lined with Copper foil, powered with a 20 Amp DC generator. I have attached to it a Schauberger vortex coil that structures water and an Environmental Harmonizer made from pure .999 Gold. All the resin for the Orgone is structured with the; Etheric Water, charged with the miracle frequency, 528hz as well as with a 13″ Crystal Singing bowl. The device is more of a traditional radionics device; it has a very grounding effect and works on the physical plane. It will help you ground into the body and open up the heart. With the Orgone machine, I am focusing more on Love than Power. As a result of that; I am including flower essences and aromatherapy and actual flowers; such as Lillies, Rose and Orchids.Layered into the Orgone are the symbols from the bio-resonance machines as well as gold, platinum and Silver flake. There is of course the traditional steel as well as numerous crystals such as quartz points, tiger, Amethyst, jade, tourmaline, topaz and turquoise. On top of the Orgone will be a bed of Peat Moss, about 4 bags full and a massive amount of Silver. Peat moss has the remarkable ability to hold charge or energy; it is perhaps the ultimate capacitor. You can see the preservative effects of peat in the story of the bog man. A dead man that was found in a peat bog that was mistaken for a recent murder victim that was well over 2000 years old! Silver is the metal that has been traditional associated with the Feminine and the moon. It reveals the shadow side of our personality which is where the latent power is. Silver also has remarkable abilities for regeneration, not to mention the accumulation of wealth. If you want to get out of debt; start to buy some silver. There is a real metaphysical power in holding the metal. The world is in the state it is, because of the use of paper currency. All the religious books from the Koran to the Old and New Testaments talk about the use of Silver and Gold as money. We have been hoodwinked into the use of paper as money, which it is not. Jennifer my assistant is helping me build the device to add more of a feminine touch. There needs to be a balance between, Love, Power and Knowledge. I have noticed we are a bit too top heavy on male energy. Finding that balance takes time and is the actual purpose of the spiritual journey. We are not perfect, but striving towards perfection, whatever that is. Radionic machines are influenced by the operators; which in this case is Bill and now me with the Orgone device. You cannot separate the machines from the people, as technology becomes more sophisticated it becomes somewhat sentient. I noticed this very profoundly with the Dotto Ring, when I had the original prototype for a scant few months before I blew out the Amps. I am still in the process of building the Orgone machine and most likely will be till the end of the summer, however it is functional now. My apartment is a massive portal due to all the Orgone and the hours of prayer and meditation that I have done over the years. My meditation of choice is pure contemplation. Radionic machines can be driven by the operators which I did over the end of last summer with the experiment with the NY Yankees. I plan on holding group meditations in my apartment to accelerate the spiritual progress of the members of the AscensionEnergyProgram.com. Machines are good, but human beings themselves are the ultimate radionic device. As the machines clear the human, they become a representation of the divine on earth; as above so below. We resonate divine qualities with the higher dimensions as we clear. Engaging the members in the active use of their spiritual power will move people beyond the passive stage into the realm of the magician. It will also help you evolve; use it or lose it. If you do not learn to wield your power, I guarantee it will be used against you. You cannot remain a victim if you expect to ascend. Ascension does not start with the couch and the TV. You have a tremendous effect on reality; now is the time to begin consciously directing your life with your mind, heart and will. It is the synchronization of these three elements that completes the circuit and makes one a shining example to the rest of mankind. 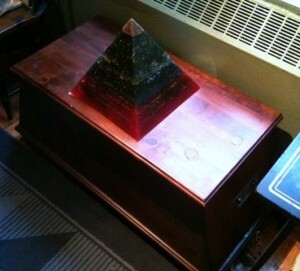 To be included on the new Orgone radionic machine, you need to send me an email. If you would like a stronger connection to the machine, I will be accepting signatures to be placed on the machine. Email me and I will reply with my mailing address.